I am using AnyConnect software on Windows 7 OS. I got new client certificate to import with dedicated import password. 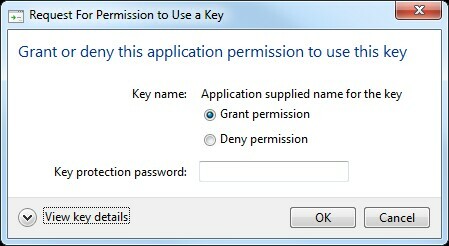 And when I start AnyConnect I get message "Grant or deny this application permission to use this key" and field to write password if I choose to grant. Which password is this? A tried import password but it's not. Since this is only happening on this one certificate, then I assume that the group policy System cryptography: Force strong key protection for user keys stored on the computer was not set on the computer, or it would happen with other certificates. It sounds like that when you imported the certificate, or when the certificate was created, it was opted to enable strong private key protection. The option may have been worded like this: "Enable strong private key protection. You will be prompted every time the private key is used by an application if you enable this option". You might be able to get around this by re-importing the certificate while not checking this option. Or if this option is built-into the certificate itself, try replacing the certificate by exporting it to a PFX file and re-importing it. If this does not work, demand from AnyConnect a certificate that does not have strong private key protection enabled. For more information see the Microsoft article What is a strong key protection in Windows? Not the answer you're looking for? Browse other questions tagged windows-7 certificate cisco-anyconnect or ask your own question. How to properly install certificate issued to me?